Scientists in California are testing sponges made with the key ingredient of baking soda as a way of capturing carbon emissions. For years researchers have been working to build experimental technology that would capture CO2 from chimneys and flue pipes before it gets into the atmosphere. The gas would then be buried permanently, deep underground. Indeed the promises made in Paris Climate Agreement to limit global temperatures to "well below" 2 degrees will need significant deployment of CCS. "Nobody can see us keeping temperatures increases below 1.5 degrees without these technologies," said Dr Oliver Geden at the German Institute for International and Security Affairs. "Yet there hasn't been any debate about this technology and it doesn't exist at scale." The equipment and chemicals that need to be built on to a power station to extract the CO2 are known to be expensive and cumbersome. While governments and industry both recognise the benefits of such a system, they have been unwilling to put up the large amounts of cash needed. Late last year the UK government pulled the plug on a £1bn competition to build a scaled-up version of the technology. Scientists are now looking at other materials to see if they can achieve the same impact but at a lower cost. At the Lawrence Livermore National Laboratory (LLNL) in California, they believe that baking soda could be a key ingredient for curbing the carbon. They've created microcapsules that have a liquid solution of sodium carbonate (also known as soda ash) at their core, surrounded by a polymer shell that allows CO2 to flow through. The tiny blue balls sit in an aqueous solution which prevents them from sticking together. When they come in contact with CO2 they change colour to a yellowish brown. Exposure of sodium carbonate to CO2 and water creates sodium bicarbonate - otherwise known as baking soda. "The whole idea is that by making these individual capsules you can have a dramatically increased surface area, so if they clump together you can decrease that," said researcher Congwang Ye. "You really want to have them separated." The scientists say that current CCS techniques using chemicals like monoethanolamine are toxic and expensive and create as many problems as they solve. The LLNL team believe that baking soda can do an effective job at a much lower price. "Like all the commercial CO2 schemes we have today, the goal for large scale implementation is taking many tonnes of gas from a power plant and finding geological features deep underground where we can inject that CO2 and it will stay indefinitely," said Joshua Stolaroff, an environmental researcher at Livermore. "Microcapsule solvents like we've developed can do that, we hope, at lower energy use and capital cost, about 40% lower than the current methods." One advantage of the microcapsule approach is that recovery of the captured carbon is done by heating the baking soda solution, and that means the scientists get a more pure form of the gas - which increases its value for other industries. But with production of the capsules limited to about a kilogram a day, the research team understand that this is a long term project. "We think in the US, our regulations will promote carbon capture and storage at a commercial scale around 2022, and we look at technologies that can be ready around that time," said Joshua Stolaroff. "We hope that around that time frame the benefits of our technologies will be developed and known." Thanks to 3D printing and advanced computational techniques, the researchers in California are not limited to capsules. They are developing a range of materials that can be built and tested quickly thanks to the technology. 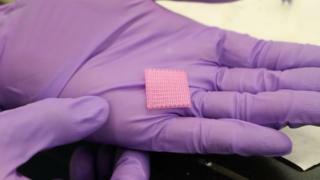 "You can think of it as CO2 capture fabric," said engineer Du Nguyen as he showed me a little pink piece of material. "What this is made of is a silicone material and inside of that are lots of little bits of sodium carbonate. You can almost think of it as a CO2 sponge." The idea is that the researchers can customise carbon capture materials to fit chimneys or flue pipes. The absorbent sponge could be printed to fill a structure completely which would more effectively soak up carbon, thus reducing costs. The researchers test the effectiveness of the baking soda materials by soaking them in sparkling water. The baking soda absorbs the carbon bubbles, rapidly turning the water flat. The scientists believe that the baking soda capsules and sponges could be used in a host of applications, not just at power plants. They argue that since the materials are easy to transport and recover the carbon gas from, they could kick start the growth of niche carbon recovery operations in places like breweries. Several years of testing and refining the products lie ahead - but the researchers believe that what they are learning could have a significant long term impact on carbon emissions. "Sometimes the solutions have been sitting right in front of you for a very long time," said Joshua Stolaroff with a laugh. "And we think there is great promise that baking soda might save the world!"